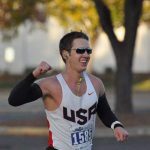 Some of our athletes are training for specific goals and races, under the guidance and coaching of one of our coaches. 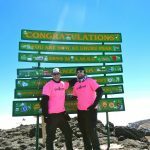 Many of our athletes are part of GRF primarily for the group workouts, training opportunities, accountability and camaraderie. 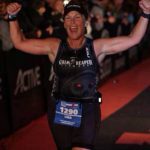 Whether you want a specific training plan and/or coach to help you accomplish a specific goal or prepare for a certain race, or if you just want to be part of GRF, these athletes are always happy to train and race with others. Contact us today to find out more about becoming a Reaper! Favorite Racing Venue: Lake Evergreen is a beautiful venue. Chicago is kind of crazy, but it’s awesome biking on Lake Shore Drive, especially when you head back South with the skyline and Navy Pier in view. Plus, it’s Clydesdale friendly (read: flat!). Best Racing Achievement of 2015: 4th at USAT Clydesdale Nationals, 1st ever Age Group win at Tri the Illini. Goal for 2017: Specifics are to be determined, but, in general, keep getting faster. Biggest challenge as an amateur athlete: There’s not enough time to do everything you want. Also, we compete from April to October (at least). Inevitable, you hit lulls in your energy level. What I like/love about GRF: I’ll give an example. We had 9 members compete at Ironman Louisville in October, but we had over 30 people at dinner the night before. So 20-some family and friends showed up in support. Biggest challenge as an amateur athlete: Dialing in my nutrition. After “hitting the wall” around mile 20 in my last two marathons, I’ve switched to a low carb diet with UCAN to supplement. So far, so good as I finished the 1/2 Ironman feeling great. What I like/love about GRF: Everyone is friendly and fun to train with. 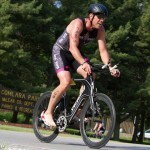 Year of first tri: I raced a sprint and olympic in the summer of 2005 (both in Michigan). I absolutely loved it, but didn’t race again for ten years. The next year we moved to Lexington, KY for graduate school and triathlons took a backseat. 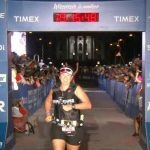 An Ironman has always been on my bucket list, so in the ten years I didn’t race, I continued to focus on riding and ran five marathons. 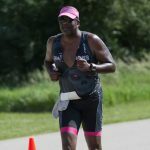 Number of races completed: I’ve done 8 triathlons, 5 marathons and not sure how many when it comes to half marathons and less. 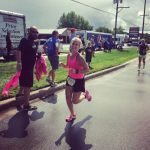 Favorite race: Any race that I’ve trained for, has good temps/weather and where my family/friends can attend. I actually prefer recreational bike rides over racing. I biked coast-to-coast the summer of 2002, and I cannot wait to do it again with my husband and boys someday. Goals for 2017: Planning and training for an Ironman. Biggest challenge as an athlete: Chronic foot/hip issues has been my nemesis the past few years. Outside of the physical, time away from family is by far my biggest challenge. What you love about GRF: I love the camaraderie and the genuine desire for all to succeed. Anytime I take a personality test, I am dead center between an extrovert / introvert, and I see this play out in my training. I love to work out with others when the timing works and my mood is right, but I also love to work out on my own….so please take no offense if I don’t join a workout :). Goal for 2016: Compete in first Half Iron distance race. PR in both sprint and Olympic distances. 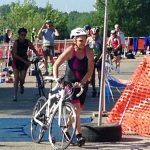 Best Racing Achievement of 2015: Won the Railsplitter (Olympic) Triathlon in Petersburg, IL. Goal for 2016: Set PR for Olympic and Sprint distances. Biggest challenge as an amateur athlete: My biggest challenge is finding time to balance both training and school commitments. What I like/love about GRF: GRF has provided me with many opportunities for improvement that I know I would not otherwise have. I have been able to make great improvements over my time with Grim Reaper. Best Racing Achievement of 2015: Finished all of them this season without walking! Goal for 2016: To be faster than last season and drop my mile time substantially! Biggest challenge as an amateur athlete: To balance work and training. What I like/love about GRF: Everyone is so welcoming, kind and helpful. And I’m surrounded by individuals with similar goals and focused on being the best person they can be both on and off the course. What I like/love about GRF: A great group of athletes supporting and encouraging others to succeed! Best Racing Achievement of 2015: doing sprint races and making it “hurt” lots of PR times in sprints. 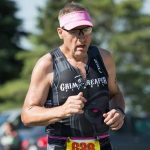 Biggest challenge as an amateur athlete: Training for IM. Biggest challenge as an amateur athlete: Being a competitor and being ok with running my own race. 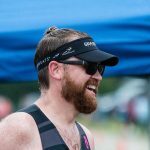 Acknowledging the tradeoffs for family and career that impact my training, and being ok with my results when I don’t have time to train like a pro – because I’m not. What I like/love about GRF: This group is my family and has done more to make IL feel like home to me than I can begin to explain. Great people who care about each other far beyond just racing together. What I like/love about GRF: The group workouts and the great friends I have made. Best Racing Achievement of 2015: Setting a new 5K PR at Susan Komen Peoria. Goal for 2016: To improve my bike and swim times. Biggest challenge as an amateur athlete: Balancing the training for all three sports and knowing how to train for races. What I like/love about GRF: The family environment, the group training, support from everyone…they’re all about the team. Best Racing Achievement of 2015: Completed my first Ironman in under 11 hours. Goal for 2016: Specifics are to be determined, but, in general, keep getting faster. 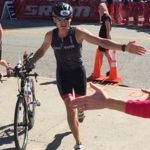 Biggest challenge as an amateur athlete: Balancing training with a family and a wife who is a triathlete. What I like/love about GRF: Love the competitiveness with everyone, along with their passion for the sport and support o and off the course! 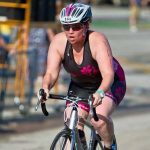 Year of 1st Triathlon: My “A” race my first triathlon year (2014) was Tri Shark. 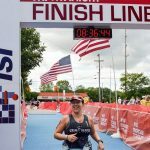 Favorite Racing Venue: Michigan Titanium Half Iron distance-the water is crystal clear and I loved it!! Best Racing Achievement of 2016: Finishing my first half iron distance under my projected time! 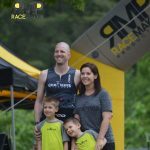 Biggest challenge as an amateur athlete: Balancing family, training and racing. I have 3 kids….9, 7 and 5! What I like/love about GRF: I love how supportive everyone is! Not only to me on the course but to other athletes NOT on our team as well. We have a great group of caring people! 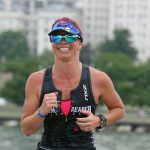 Favorite Racing Venue: I have had some amazing experiences in new venues including Milwaukee Age Group Nationals. Best Racing Achievement of 2015: 2015 1st place age group at club nationals in half aqua bike, and 2nd overall female at Trisanity Super Sprint. Goal for 2016: Compete in a HIM, Cozumel is my first choice. 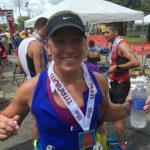 Biggest challenge as an amateur athlete: Balancing life with training as well as overcoming my habit of puking on the run. What I like/love about GRF: I love the competitive nature and comradery of the GRF family. I would never have pushed myself to the level of competition without the support of the team. My fitness level has improved beyond my expectations as well as my national rankings. I have always been very active in swimming and biking but to have the support of the team has enhanced my life. My abilities to compete have improved greatly with the guidance from all of the team members and coaches. 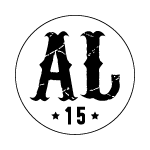 Goal for 2016: 5 1/2 Iron distance 1 at 4:30. Biggest challenge as an amateur athlete: Finding free speed. Technology and technique are key to cutting time. What I like/love about GRF: I’m a GRF for the team mentality and training partners. What I like/love about GRF: GRF is about the members and the support they extend to one another. 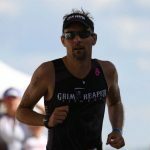 I’m in GRF for the challenge, to educate myself about endurance sports, and to compete. 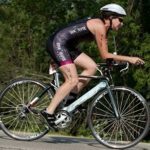 Favorite Racing Venue: Lake Evergreen is a great venue, and it’s local! What I like/love about GRF: That’s easy – the people. The support in training and in racingis amazing. There’s always someone to push you, encourage you, train with you, race with you, and cheer for you. 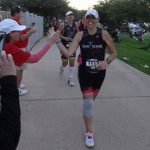 Finisging a race is a big accomplishment … doing it with several people in black and pink cheering for you makes it special. Best Racing Achievement of 2015: Took 2 minutes of my 2014 time at Dri-Shark Duathlon. Biggest challenge as an amateur athlete: Swimming! What I like/love about GRF: The support from all the members. 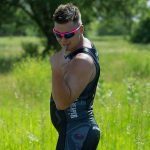 I’m in GRF because it gave me a chance to change my life and physical fitness. 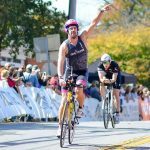 I have learned how to train for a multisport event and I love it. Goals for 2017: Stoneman I sat out the 2016 season so the goal this year is just to get back into racing and hopefully place in the Stoneman. Biggest Challenge as an athlete: staying motivated for training which leads to what I love about GRF, the camaraderie and support from the team makes it easy to push yourself through the hard times. No. of Races Completed: Close to 40?? 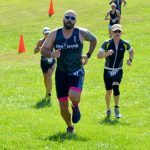 Favorite Racing Venue: Tri-Shark, I love the local venue. Goal for 2016: Get faster and Stay injury free. What I like/love about GRF: GRF is more than a club. It’s a family! I love that my GRF friends push me to do my best and we always have fun! No. of Races Completed: Triathlons: 12 (ranging from Sprint to Ironman), Road Races: Too many to count (ranging from 5K to Marathon). Best Racing Achievement of 2015: AG 1st place – State Farm 5k. AG 2nd place Park 2 Park 5 miler. Goal for 2016: Finish Ironman Wisconsin before sunset. Goals for 2016: Work hard, have fun and enjoy it! What I love about GRF: The pink! Favorite Race: Haven’t done any and don’t have any favorites yet, but I would like to do some Olys this year — possibly a half! What I love about GRF: I guess I’ll find out, but probably getting to go to races with groups of people who support each other! 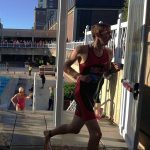 Best Racing Achievement of 2015: Come out of the water 7th overall, was 5th overall after the bike leg in a half ironman distance. Goal for 2016: NOT CRASH ON IRONMAN! Biggest challenge as an amateur athlete: I get in my head a lot and I often doubt myself. 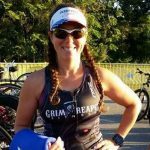 What I like/love about GRF: I went into my first tri more scared than excited. Somehow I made it through, yet apparently there is video of me screaming out “F***” real loud after the swim. 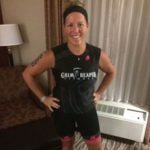 I was/am excited about GRF because from day 1 with the club you have a beginner tri program so you can meet others in the same mindset as yourself as well as meet several coaches. Then all the group activities provides another way to interact and ways to continue to push each other. 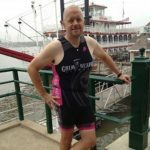 None of these opportunities were present when I was just beginning my journey into triathlons so all of these things in place help make GRF special. Best Racing Achievement of 2015: My first Half Iron at Club Nationals was my personal highlight. Great venue, perfect weather, and lots of GRF support. Goal for 2016: Stronger swimming and more time spent on the bike. Biggest challenge as an amateur athlete: Time is always the enemy. Figuring out which way to put a wetsuit on is a close second. What I like/love about GRF: Because GRF members are all about support and helping others to excel! Can’t say enough good things about the motivation that my team members provide. 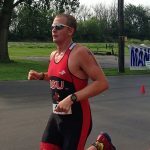 Year of 1st Triathlon: 2011, Lakeland Bi-Tri Classic. 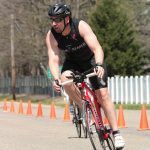 Was my “prep/training” race for the Chicago triathlon a month later. No. of Races Completed: So hard to remember them all! ~8 Triathlons (doesn’t include relays) including IMAZ 2014 and 32 marathons total. Can’t even begin to count other races. Started running in 2000 and first marathon was Chicago in 2002. Number of races completed: A bunch! What you love about GRF:The people! Racing and training together. All the support! I Love racing with my training partner from day one, Stephanie Heppe! 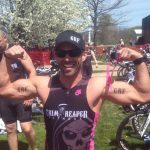 For those athletes not interested in a training plan from Grim Reaper Fitness, but who would like to participate in our group activities, be included in our weekly activities email and upcoming races, and have access to our products and special discounts, we invite you to join our Grim Reaper Fitness Club.